Syrian refugee and education activist Muzoon Almellehan visits a classroom at Yakoua school in Bol, Lake Region, Chad, Friday 21 April 2017. There are 500 displaced children attending the school of 800 students and only eight teachers, causing strain on an already weak education system in Chad. NEW YORK, 19 June 2017 – UNICEF announced today, on the eve of World Refugee Day, the appointment of Muzoon Almellehan, a 19-year-old education activist and Syrian refugee, as its newest – and youngest – Goodwill Ambassador. The appointment makes Muzoon the first person with official refugee status to become an Ambassador for UNICEF. 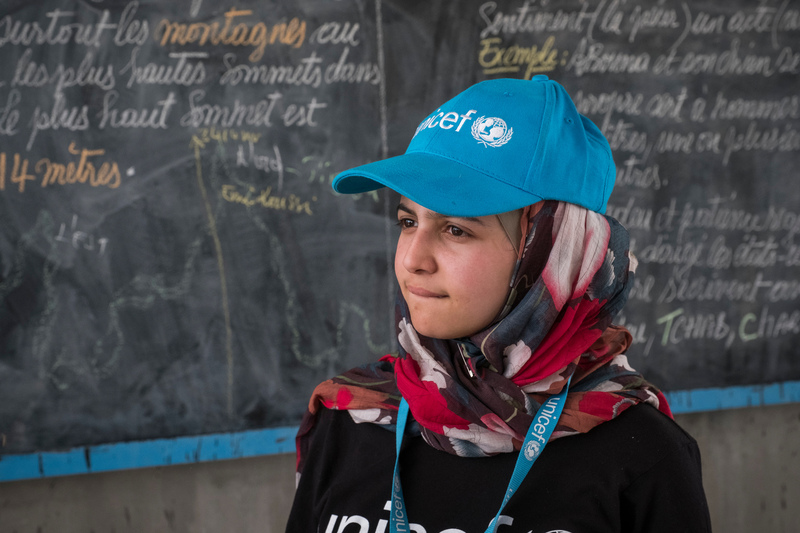 Muzoon, who received support from UNICEF while living in Za’atari refugee camp in Jordan, follows in the footsteps of the late Audrey Hepburn, a Goodwill Ambassador who was also supported by UNICEF as a child. Muzoon fled the conflict in Syria along with her family in 2013, living as refugee for three years in Jordan before being resettled in the United Kingdom. It was during her 18 months in the Za’atari camp that she began advocating for children’s access to education, particularly for girls. “Muzoon´s story of bravery and fortitude inspires us all. We are very proud she will now become an Ambassador for UNICEF and children around the world,” said UNICEF Deputy Executive Director Justin Forsyth. Muzoon recently travelled with UNICEF to Chad, a country where nearly three times as many girls as boys of primary school age in conflict areas are missing out on education. She met with children forced out of school due to the Boko Haram conflict in the Lake Chad region. Since her return, Muzoon has been working to promote understanding of the challenges children affected and uprooted by conflict face in accessing education. An estimated 25 million children of primary and secondary school are out of school in conflict zones. For children living as refugees, only half are enrolled in primary school and less than a quarter are enrolled in secondary school. Education in emergencies is severely underfunded. Since 2010, less than 2 per cent of humanitarian funding has been spent on education. $8.5 billion are needed annually to close this gap. Across the globe, nearly 50 million children have been uprooted – 28 million of them driven from their homes by conflicts not of their making, and millions more migrating in the hope of finding a better, safer life. Refugee children and adolescents are five times more likely to be out of school than their non-refugee peers. Girls affected by conflict are 2.5 times more likely to be out of school than boys. Protracted crises present complex challenges. Refugees spend on average 17 years displaced, almost an entire childhood. Education in emergencies is severely underfunded. Since 2010, less than 2.7 per cent of humanitarian funding has been spent on education. $8.5 billion USD is needed annually to close this gap. Promote measures to combat xenophobia, discrimination and marginalization in countries of transit and destination.